Merging multiple similar roads that are cut by a bridge? I tried merging some of those ways before but it could not be merged because of the bridges in between. Should they really be separate entries despite referring to a single road or is there a solution to merge them despite the bridge in between? Roads are split like this because different sections have different tags (which might not be bridges - and many tag differences won't be visible on e.g. openstreetmap.org). That's perfectly normal - data consumers such as routers will merge together as needed. Ok, but will this not present a problem for GIS users, especially since these separate entries have different ID numbers? 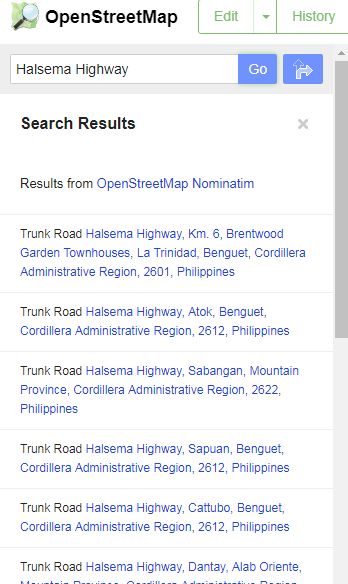 The ways would appear as separate entries when filtering for a way using the road name. He is right though, that it can be quite confusing, when doing searches with Nominatim. @JAT86 Yes, but it's part of the processing that GIS users will have to do in order to work with OSM data. Another thing that they'll have to get used to is that there are no hardcoded "layers" (though people have created shapefiles based on OSM data to make things easier for GIS users). It will probably cause problems for people used to other conventions, but due to how OSM's data model works, it's kinda unavoidable. The OSM data model would not have problems that other conventions would have. OpenStreetMap's data model is not optimised for particular third-party users. It's expected that you will post-process the data into whatever format and layout you need. We do use relations for waterways (like rivers), so this sounds like a good idea for multiple segments of roads too. There will be also similar problems, especially with continuity - waterway going through the (named) lake is similar to a road going trough the named roundabout or square. Impossible. Ways must be continuous in order to be merged. How to see roads underneath areas in JOSM ?